OMG Posters! » Archive "Batcave" Art Print by JC Richard from Mondo (Onsale Info) - OMG Posters! Mondo will release JC Richard’s “Batcave” tomorrow. It’s a 20″ x 29″ screenprint, has an edition of 500, and will cost $50. If you’re in the Austin area, you can buy one in person at Mondo today (Wednesday, August 29th) at 5pm. If you’re not in Austin, these will be available online tomorrow (Thursday, August 30th) at a random time. Visit Mondotees.com. Any time you are assigned the task of reinterpreting an iconic setting with a long established history, it can be intimidating. You begin knowing how passionate fans are about the universe, and that many of them have their own definitive idea of what the Batcave looks like. Do you hew closely to the established comic/tv/movie canon, or take some chances to create something new? Do you keep it a clinical, cross-section rendering, or attempt to go deeper and tell some kind of narrative within the scene? For our take on the Batcave, we decided on another option… trying all of the above. The main goal was conveying a sense of semi-realistic, real world architecture. Certain Batcave designs have seemed so grandiose and advanced that it stretches credulity to think it was constructed by anything but a major construction team (this issue has been explained away in certain storylines, but never convincingly imo). I tried to make the basic infrastructure seem like it could have been completed level by level by a tiny number of people as opposed to a small army. This layout seizes upon the idea that the cave had been used for years by Wayne ancestors; many of the tunnels and storage rooms would have been excavated long ago for use in various smuggling operations or part of the Underground Railroad during the Civil War, and Bruce and Alfred simply added to them as needed. And what about the ‘stuff’? 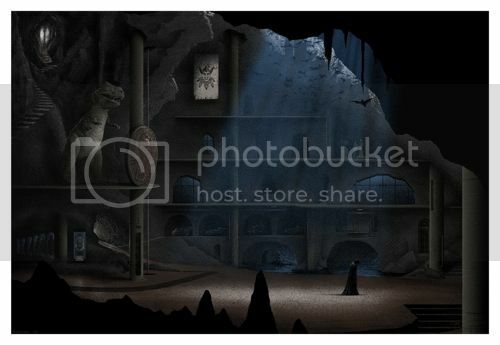 Some items in the cave should be familiar to all Batman fans, while certain things would only be recognizable to comic readers; for instance, the ’47 Penny, the T-rex and the Joker card all come from the comics canon, while other items such as the ‘legacy’ batpole references the ’66 series. Other aspects of the cave are purely my invention- such as the concept of hiding all the sensitive tech/laboratories behind sealed windows and doors (would a sensitive Cray supercomputer operate long in an unprotected cave environment? I never thought so either.) Most importantly, I wanted the space to feel ancient- like a long neglected museum hall with dusty, outdated exhibits set among more useful technology and vehicles; Bruce has never been able to let go of his demons so he surrounds himself with them, using artifacts to masochistically remind himself of the pain and loss of the past. I’ve also thrown in a few ‘new’ features that were never mentioned in any story- an old door to an imagined Wayne ‘archives’ area, leading to more secrets, maybe even long lost family catacombs… an Eternal Knot carved in relief on the wall, reminding Bruce of his training and constant need for compassion alongside vengeance. I’m just gonna say it, this is a pretty crappy bat cave. I read the artists write up, but this is just a very very boring image. I agree that its not great – which is a shame as his dragonslayer print and Lord of the RIngs prints are fantastic. …but his WALDEN is UNBELIEVABLE! He’s been a big let down ever since.